Provide Natural Vitality & Energy to the Body and Cells from Morning to Night. Complete Multivitamin for all bodies! This liquid Multivitamin includes all essential vitamins, minerals, antioxidants, trace minerals and amino acids for your body’s daytime needs. Each bottle comes with 30-32 servings. Strengthen hair, skin & nails with biotin & vitamin A, rebuild cells with a complete amino acid complex, and boost your mood with Chromium, Calcium Folinate, Zinc and Vitamins B6, B12, D3. This formula is designed for easy absorption, so you can readily benefit from all the essentials your body needs. Triple UV Treated Deionized Water, Non-GMO Vegan Vegetable Glycerin, Non-GMO Vegan Natural Raspberry Flavor, Non-GMO Vegan Xanthan Gum, Non-GMO Vegan Cranberry Extract, Organic Non-GMO Vegan Aloe Vera Extract, Organic Non-GMO Vegan Noni Juice, Non-GMO Vegan Potassium Sorbate (to preserve freshness), Non-GMO Vegan Gluten Free ConcenTrace® Trace Minerals, Non-GMO Vegan Lichen. Amino Acid Complex: L-Alanine, L-Arginine, L-Aspartic Acid, L-Cysteine HCL, L-Cystine, L-Glutamic Acid, L-Glutamine, Glycine, L-Histidine, L-Isoleucine, L-Leucine, L-Lysine HCL, L-Methionine, L- Phenylalanine, L-Proline, L-Serine, Taurine, L-Threonine, L-Tryptophan, L-Tyrosine, L-Valine. Each bottle comes with 30-32 servings. Store in a dry, cool place. Refrigerate after opening. We make our vitamins fresh daily, with a two year lifespan from the time of production. Once opened, they last for 6 months in the refrigerator. How to use: Take the recommended dose by itself or add to any drink, smoothie, or recipe. Our Liquid Morning Multivitamin can be taken on an empty stomach, with food or liquid, or after a hearty meal. No hard to swallow pills! This Liquid Multivitamin is easily absorbed & readily bioavailable. These formulas are designed for maximum absorption and assimilation to ensure that your body gets the essential elements it needs. A: We recommend that everyone to start ½, or even ¼, dose to see how their body responds. Since every body is different, you may see that you do better with a smaller dosage. Your physician or health care professional can help you find the proper dosage. Our Multivitamin can be taken on an empty stomach or with food, or with other liquids or juice. Q: What does the flavor come from? A: Our Liquid Morning Multivitamins get their great taste from Non-GMO, Vegan, Natural Raspberry Flavor, which comes from raspberries. The process by which we manufacture our flavor makes sure that there is no MSG, GMOs, aspartame, glycol and propylene, which are the main culprits in toxic flavors. When searching for ingredients to put in natural and dietary supplements, it is important for a company to always look to ensure those standards are met. Q: I see there is NO SUGAR in the vitamins, which is great! What makes it sweet then? Q: Can children use it? A: Yes, children, aged two and up, can use our formula. However, before you give the Multivitamin to your children, we highly recommend that you show our formula to your physician, pediatrician or healthcare professional to see if our formula is right for your child. If it is, ask your healthcare professional to assess what the accurate dosage would be for your child. Each child is unique and different, and we want to make sure that they receive the best care possible! Q: How can I travel with your vitamins? A: We are currently working on a travel size which should be available soon. Meanwhile, many customers ration the appropriate amount of liquid they need for their trip and put it in a lunch box with an ice pack until they can refrigerate it when they arrive at their destination. Pack-It lunch boxes are a great option as they stay cold for the entire day. Q: Why doesn't your morning vitamin formula include IRON? A: Great question! We decided not to include iron because of its constipating effects. In addition, many of our customers desired a formula without iron and if a customer does require iron for their diet, they are supplementing it with a stand alone iron supplement. A: Many of our customers see immediate physical results, in energy or improvements in hair, skin and nails. However, some of our customers don’t feel any difference at all. Many changes the multivitamin will have on you will be strictly internal and show results in bloodwork or better digestion. We have seen that those who are more vitamin deficient experience greater positive results right away. Regardless, please reach out if you are not satisfied with the product. Q: What if I forgot to refrigerate my Multivitamin? A: Some customers have forgotten to refrigerate their Multis after opening. We have done testing on the multivitamins and multiminerals: results suggest they are good for 7 days out of the refrigerator. We like to err on the side of safety and say 5 days. Q: Are the bottles BPA free? A: Yes, the brown and white bottles we use for our Multis are BPA free. I wanted to write a review the first week I started taking this. I decided to wait. To actually get through the bottle then decide how I felt about it. These vitamins have greatly improved my life. I was diagnosed with Hashimoto's thyroid disorder in December of 2017. My doc said that a few diet changes and a prescription for levothyroxine is all I needed. What a nightmare!! The hormone found in the prescription sent me on a wild ride of mood swings. My t3 and t4 levels went all over the place. I felt miserable and people thought I had lost my mind. I decided then and there I would rather suffer the symptoms of Hashimoto's than be on medication. I felt this nagging to get healthy though. That's what lead me to the doc in the first place. So I did some research about more natural methods and found info on supplements that help with my issues. The more research I did, I found that I would be buying multiple products to get what I needed. Then I stumbled across Mary Ruth's. I bought the triad. I felt amazing a week into it. My thyroid was no long swollen in my throat. My energy has been amazing. Brain fog lifting. My hair and nails looks amazing. Skin glowing. I sleep like a baby. The days I've forgotten to take it have been felt. Days I do take it, I feel ready to go. Stressful days at work are a breeze. I wish I had more room to keep writing. This product has brought me to a wonderful balance. I've tested normal in my thyroid levels consistently! Thank you! Thank you!! I recently purchased the gummies and thought they were delicious! I look forward to taking them every morning, they are my little treat! It’s great to have products that are the highest quality and a company that cares. Thanks for all that you do to keep us in good health! 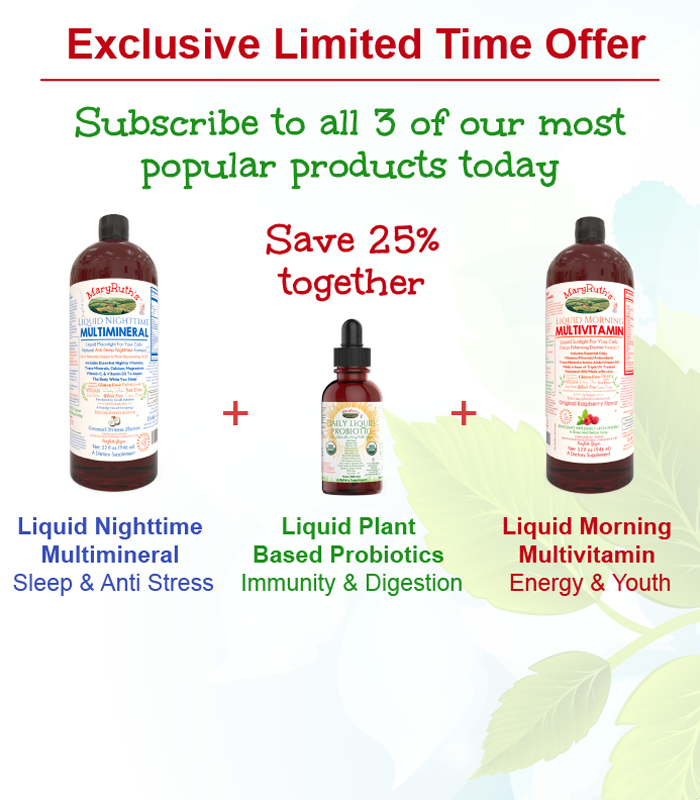 Vegan Liquid Morning Multivitamin - Awesome product! I have a recurring order every 30 - 45 days. For years I searched for a liquid vegan, organic no fillers multivitamin with no preservative what so ever. I do not quite remember how I found Mary Ruth; I think I might have been through Amazon.com. Still, since then I have a recurring order for the liquid multivitamin. It tastes good, it does not hurt my stomach. I have difficulties swallowing pills. And liquid has a better absorption rate. So, this product is perfect. My husband love it. I take it at least 3 times a week while my husband, who is a martial arts and personal trainer and a high performer athlete takes it every day. I love the company's concept. The customer service is superb! I once got charged for a recurring order I had on the liquid multi mineral but I meant to have the multi vitamin as it was the one finished. I wrote Mary Ruth, they cancelled the multi mineral, refund my credit card, placed the order for the multi-vitamin. It was awesome they were able to accommodate my request. I am not a doctor and don't claim to be, I just know what worked for my daughter and me. I have ADD. My daughter too. 2 yrs ago, I started to treat symptoms using nutritional supplements and not usual stimulants. I used the morning vitamins, nighttime minerals, probiotic, and zinc from another source. Took a year for our bodies to adjust and finally function differently, with behavior modifications too. Never felt more clear and functioning in my life. Daughter's life has changed. Stopped taking about a year ago... got lazy. Within months we were scattered, moody, craving sugary foods, and plain lazy. Daughter was struggling, impulse and self control, forgetting things, forgetting to focus to get tasks done. So I came back to Mary Ruth and subscribed, and I won't ever stop. Good book is Finally Focused by James Greenblatt. He is THE MAN who can break down ADD so well to help anyone understand why it's so vitally important to supplement the diet. Eating right alone is not enough. After trying many different things over the years, numerous vitamin bottles that I'd have to take from each day, and after doing spreadsheet after spreadsheet of which liquid vitamins have this and that, I settled on Mary Ruth Organics... she has it all in here, except maybe less zinc than my daughter and I require, but that's okay. Love taking my vitamins every day... my daughter does too because she notices she is a more focused person, able to manage herself more effectively.